Carillion Rail required an on-line tracking system to manage weld orders from internal and external customers and their allocation to welding teams from different depots. Carillion’s Rail division uses contractors for its rail maintenance and repair work. They required an on-line tracking system to manage weld orders from internal and external customers and their allocation to welding teams from different depots. Blueberry was asked to build a job management system to manage these different teams, who are chosen on the basis of availability and proximity to each welding job. Blueberry divided the project into two clear systems: order management and scheduling and rostering. These were completed in two phases to facilitate its seamless integration into Carillion’s working practices. The new on-line Welding Management System for Carillion Transport allows rail welding orders to be aggregated together into a single database. Resource planning tools allow orders to be ‘rostered’ and worksheets to be produced automatically that allocate welding teams to jobs. The system allows ‘actuals’ to be entered, indicating actual work completed as opposed to what was rostered. The data feeds into an invoicing system that enables Carillion to raise accurate invoices. The new on-line Welding Management System for Carillion Rail consists of order management and scheduling modules. 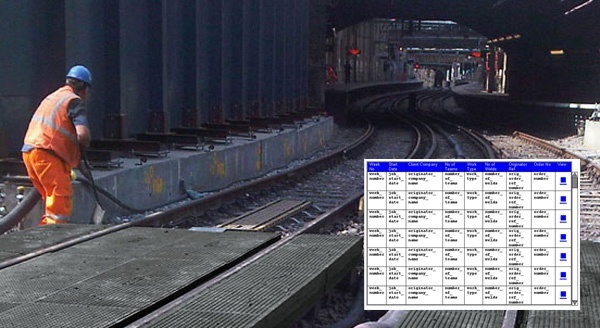 The WMS System allows rail welding orders to be collected together into a single database so that web-based worksheets can be produced – facilitating informed scheduling decisions by management. There are future plans to extend the System to record the actual work carried out as opposed to planned work, so that accurate invoices can be automatically raised.